WoW -> Beta Sign Up -> Form. The Beta Sign Up form has been down since the closing of the Wrath Beta. It has once again been opened. If you have a Blizzcon card you can go here to enter your information and get your spot claimed for the coveted next beta slot. Nothing huge, but does this mean Starcraft 2 beta is nearing release? Authors of WoW Matrix take some steps to help. Donation links that we are aware of. to send us their Donation links. if you are in a position to do so. In addition, we can (if you like) link to your Donations page from within the updater and on our website, and optionally, if bandwidth usage is a concern for you, host your AddOn(s) on our servers at no charge. So please keep an eye out for this and support those that help make the game better for us. This is a sad day. One of my favorite mods ever in the the game and almost an essential guild tool, Group Calendar, will no longer be publicly available. Blizzard saw the need for an in game calendar, however theirs was so poorly done that we still need this addon. Please support this author and his choices. He is providing us a service that Blizzard is currently not offering in an effective manner. I personally believe a donation request in game on their addons is perfectly acceptable, charging for an addon to use, I believe is not. This seems to me very similar to the mod community for Half-Life. This is a poor option of Blizzard to eliminate or frustrate a big portion of their community. Many of these mods make a guild master and raid leaders life easier. One big problem with this new model is WoWMatrix, with this application, users no longer have to go to the mods hosted location or the authors site to get updates. This in turn eliminates and banner traffic or donation buttons that may pop up. Which as you can tell directly effects the number of donations and visits to their sites. WoWMatrix developers should work with all places they host their sites and add the ability to donate directly to the authors in the description field on the bottom of the app. Anyway, it is a sad sad day in the WoW addon community. If you are upset with this policy, please let Blizzard know. They have used other users mods, I am looking at you Fizzwidget, and incorperated them into the game in almost an exact same manner as the mod was written. These are essential to make our life easier and those who do the work deserve the right to soliciate donations for their hard work. Also, write to wowmatrix and use my suggestion, this will help out the community we need to help make our WoW expieriance a lot more enjoyable. This coming Saturday night, at 5 PM CDT, we have out first joint guild run of NAXX-25. I am unsure of how this will go or what we will be able to accomplish. Our guild leader worked the deal out with this other guild. I have a feeling things will go fine, however I am unsure as to the methods we will use and which guild will be the lead. I am not really concerned. I have the hope of the Arachnid quarter and the Plague quarter done. It will mainly depend on how well we do on Safety Dance. We tried this experiment once, it resulted in a guild merge that exploded weeks later when we had found success on a boss and our methods were disregaurded for the others. Simple disagreement, but it lead to a big guild drama that resulted in a break up. We are a guild are small, the same 7-8 raid every week for the 10 mans. We hope to down Malygos on Friday night, we have had bad luck with disconnects and strategy in the past. So this combination for the 25 man will be interesting. I generally prefer to run larger raids like a democracy as long as people are pretty happy with the way the run is going. Anyway, keep an eye out and I keep you up to date as how it went. I am also working on a post about the effects of an e-sport client has on a game. I have a great problem with the lengths Blizzard has been going to create this play balance in many classes and the route these PvP effects of these nerfs or buffs and the effect they have on raiding builds and their builds. So keep an eye out for it. *I am giving them the benefit of the doubt on this one. For those who do not know, I am a big fan of the instance. Scott and Randy progressively proceed to crack me up every week and make my work day go just a little bit quicker for the hour and a half or so that I get to listen. 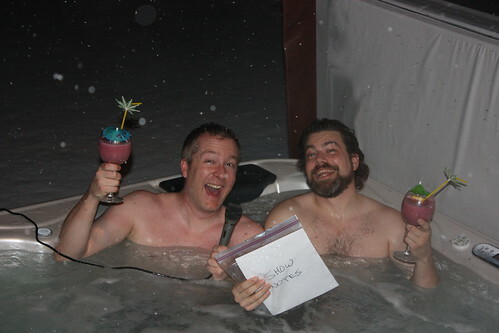 This week Randy happened to be up at Scott’s house and they did the broadcast live from the hot tub. For those who listen, this is the very same hot tub that can cause “reverse-hydrocution”. Needless to say, the picture made me laugh. There is lots of WoW talk, plenty of jokes, some bad humor and just all around fun. They also have a mod of the week feature, which recommends some good ones. In a quest to get my Black Amani War Bear I worked with a guild/pug of the For The Alliance! achievement. We managed to get through everything except Thunder Bluff. The biggest problem was we got to Thunder Bluff and there were skeletons all over Cairne Bloodhoof. We missed him in just a little bit. We averaged 30-35 people and walkin killed and moved on. The Horde had no idea what hit them. We were a force. It was a nice piece of honor points, so when I get around to spending some of them, it makes it a little easy. I tanked a few of the heavy hitters down in the UC, so that was lots of fun. Reminded me of the old 40 man raids, running like an army across the plains, daring to be stopped. So anyway, if you are bored, put together a group and get your bear!